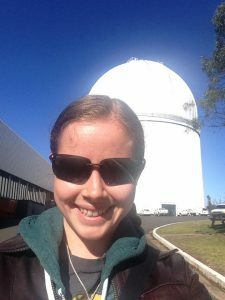 Guest post from former Nottingham undergraduate (MSci Physics 2017) and now first-year PhD student Lizzie Elmer, who went to Australia for a summer research experience and ended up playing an important role in one of the most exciting recent discoveries in physics! 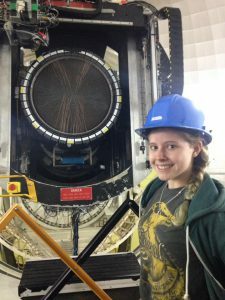 As this was pretty soon after the announcement of the first detection, I was obviously very excited to get a chance to work with gravitational waves so soon! Unfortunately, the first time I talked to my supervisors for the summer, they were very quick to say that it was very unlikely that we would actually detect any electromagnetic signatures from gravitational waves, it was much more likely to be supernovae detections. Obviously, this was a bit of a dampener on my enthusiasm, while supernovae are cool – merging neutron stars are much cooler! Despite this, I shipped myself off to Sydney on the 14th June 2016, more than a little anxious about what I was letting myself in for. After a weekend setting myself up in my home for the next few months, and getting over my jet lag, I headed into the office. After an initial meeting with my supervisors, Chris Lidman and Tony Farrell, I found myself sat at a desk with a new email address and a pile of reading to help me get started on my project. The project involved using 2dF-AAOmega, a multi-object spectrograph that has the capability to view 400 objects at the same time. I was writing code that instructed the 2dF robot to move a single optical fibre into a position that would allow that one fibre to point at an object, and a guide fibre to point at a reference star that keeps the telescope on target. For a normal configuration of the instrument almost all of the 400 fibres would be moved, taking about 40 minutes in total. My task was to reduce this to 10 minutes. While at the time this seemed impossible, especially when all the programming had to be done in a language I had never used before, I ended up with a working version of the code within 6 weeks. This meant I got to test the code myself, and attempt to do the first sky tests of the mode. Unfortunately, the night we planned to do these tests was cloudy, but I still got to see where my code would be executed from in the telescope control panel, and check that the code did move the telescope as we expected it to. It was actually on target within 5 minutes! So, after some travelling in Australia, I headed back to England in the knowledge that my code definitely didn’t break the telescope, but not sure if it actually pointed it at the correct part of the sky. A month or so after returning home, I was sitting in the middle of a gravity lecture when an email came through from Chris – my code had been tested on two bright stars and it worked perfectly! I think its fair to say, I didn’t pay much attention to the rest of the lecture. 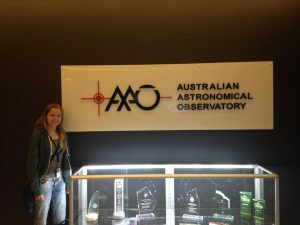 At this point I was starting the process of applying to PhDs, so it was a huge bonus to point admissions officers towards the section of the AAO website that told astronomers how to apply to use my mode of observations the following year. But the biggest news came on the 24th August 2017. An email was sent to all the staff at the AAO (and me) saying my mode had been used successfully for the first time – and it was on something big. This started a flurry of emails (very few of which I understood) that clued me in on what had happened. My Target of Opportunity mode had been used to view the first ever electromagnetic counterpart to a gravitational wave! Just as they had advertised it might be when they first offered me the project! Of course, at this point all I knew was that it had been pointed at something that might be a counterpart, I didn’t know for sure what had been viewed. During the press release about the event, I was a little confused; my mode had been used on the 24th but the detection was on the 17th? After emailing Chris, he assured me it was the same event but a few days later when it became too faint for the smaller telescopes to get a spectrum from it. He also told me that I was named as co-author on a paper about it. It was a spectacular way to christen the Target of Opportunity mode, and I can’t wait to see what other discoveries it will aid!